Super Hero Boy: My favorite Baby Einstein yet! My favorite Baby Einstein yet! Though Connor really enjoys Baby Einstein especially right before bedtime I have to admit the lack of talking makes it a bit hard for me to watch. I absolutely love that he likes it but usually its one of those dvds we watch for quiet time. However the newest baby Einstein kept me watching the TV as well and got us up and moving. Baby Einstein World Music is the newest edition to the Baby Einstein family. This series in both the DVD and CD your child will be introduced to music and instruments from all over the world. African Drums, Celtic Harps, Latin Maracas all blend together to make a soundtrack that is worthy of dancing. Dancing is our big past time in this household and Connor loves to dance so nothing makes him more happy than if I get up and dance with him. Usually his "kid" music does not inspire such a reaction in me but the soundtrack of Baby Einstein World Music did get me on my feet and we watched while he danced and cuddled, a rare treat. While the beautiful music is playing the dvd features animals, landscapes and scenery that coincide with the music that's playing. We especially loved the ocean scenes as Connor is huge into fish right now. We actually went to the zoo today and he was more interested in the fish and turtles inside the enclosures than he was the animals. Go figure. 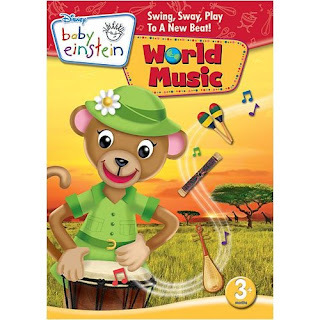 If you love the music on the Baby Einstein World Music dvd you can also purchase the Baby Einstein World Music CD that features the same music in a more portable format. Or if your just looking for some great music to play during playtime its a great cd all on its own as well! Visit Baby Einstein to learn more about their products or to see a preview of the new World Music DVD! Thanks Mom Central for letting us know!